When you think of Donald Trump, what is the first thing that comes to mind? It may be his hair or his trademark “You’re Fired!” or a number of other ventures that have the Trump name, but where he has been most successful is real estate. 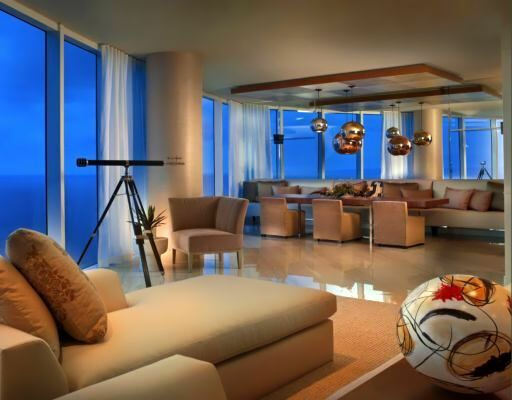 And the property that bears his name in Hollywood, Florida, a luxurious oceanfront condo, is as opulent as they come. I’ve had occasion to visit Trump Hollywood several times in the last month, as various clients have asked to view the property. Each time I’ve been impressed with the quality and also the value that’s being offered. So today, I want to share with you some background on the property and also my impressions. The Trump Hollywood (center circular building) is a 40-story glass high-rise condominium. Trump Hollywood was developed jointly by The Related Group of Florida, Boca Raton-based Ocean Land Investments and New York real estate mogul Donald Trump. And just as Trump has his world renowned New York property that bears his name, Jorge Perez of the Related Group built Trump Hollywood as his own signature property. 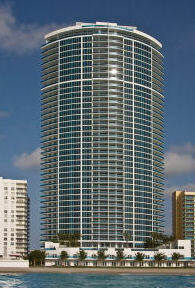 Despite having developed many impressive properties such as the massive, 1,800 unit, Icon Brickell in Miami, Trump Hollywood is the property Jorge Perez wishes to be remembered for as his crowning achievement. 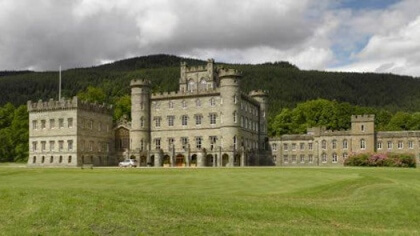 With good friend Donald Trump offering his input and licensing his name, and with a team that included the finest architects and interior designers, he has completed his dream. The project was off to a great start when architect Robert Swedroe designed the property and it won a “Building of America” Award. The international design firm of Yabu Pushelberg, well known for their designs for clients Ritz Carlton, Tiffany & Co., and Mandarin Hotel were commissioned for the interior design and furnishings of the building common areas. With such impeccable talent involved in the development, you can see why the finished product is spectacular. 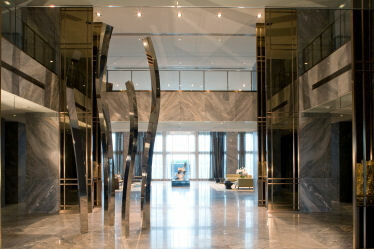 The elegant port cochère entrance leads to a grand two-story entrance lobby. 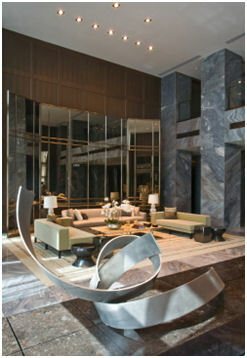 Trump Hollywood is a stunning condominium highrise with 240 feet of ocean frontage. 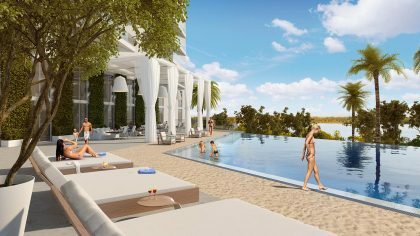 The 40-story contemporary glass tower sits on five acres and features 200 expansive residences, all with private elevator access and with unobstructed, panoramic views of the ocean, Intracoastal Waterway and city. 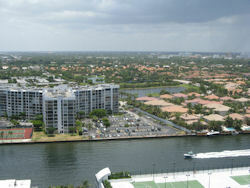 Views from 22nd floor up the coast north of the property & across to the Intracoastal. Each condo has elegant double-entry doors leading to flow-through floor plans, as well as high ceilings, floor-to-ceiling tinted glass and terraces. 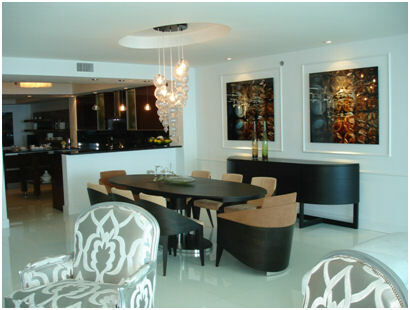 The condos are designed to take advantage of the water views from nearly every room. Details like imported limestone floors and Italian cabinetry in the bathrooms and high-end appliances by Miele, Franke and Sub-Zero in the kitchen are just the beginning. Factor in the “Smart Building” technology featuring wireless control pad linking residents to building amenities, and you can understand the appeal of these condos. 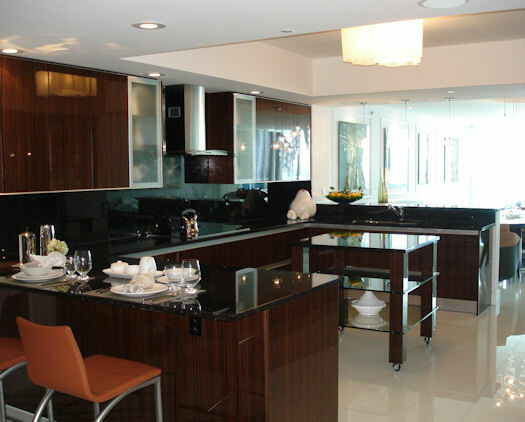 The kitchens come with top-of-the-line appliances and Italian cabinetry. 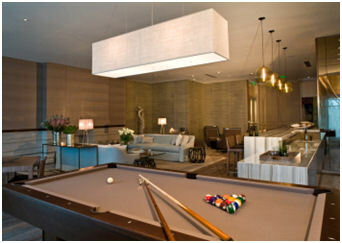 Enjoy a game of pool in the club room. 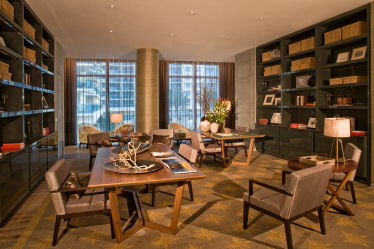 Relax with a quiet book, or reserve this room and host an elegant party. 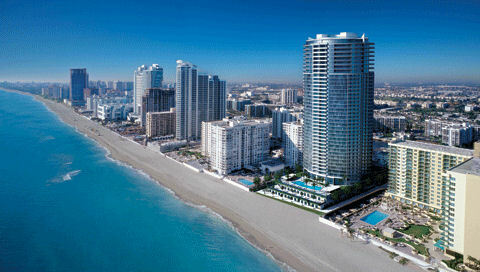 Trump Hollywood is minutes away from everywhere you want to be and all that Miami and Fort Lauderdale have to offer. Within 15 minutes of the property, you have access to world-class dining and shopping at Bal Harbour Shoppes, Aventura and Las Olas Boulevard. 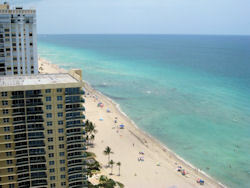 You’ll also find museums, theaters, the Ft. Lauderdale/Hollywood International Airport and Port Everglades nearby. Even closer to home, within five minutes of your front door, you’ll enjoy walks on the Hollywood Boardwalk, shopping and dozens of restaurants at Hollywood Circle. The newest addition to the immediate area, The Village at Gulfstream, is a 1,000,000 sq. 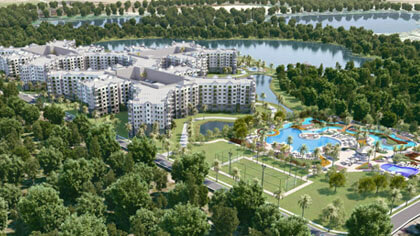 ft., brand new, upscale development, loaded with outdoor cafes and fine dining restaurants, unique shops, bustling nightlife and entertainment, casinos and even horse racing. While you couldn’t ask for a more beautiful place to call home, the inherent value in Trump makes Trump Hollywood an attractive investment too. This may be why they are selling more condos in the high-end market than all of their competitors combined. 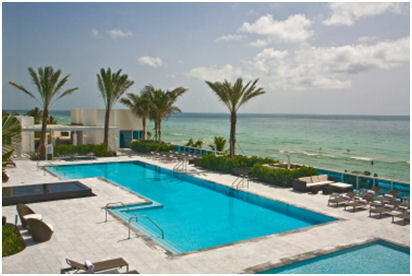 The condo’s spacious pool deck overlooks the ocean and offers beach access. There are 200 units in the building. The original developers are out, victims of the downturn in the real estate market. All previous contracts (at prices that were significantly higher than today’s prices) were cancelled. Under new ownership by a partnership that includes the 13th largest hedge fund in the world, sales began anew on January 1, 2011. Prices were adjusted by 35-40% to current market value. Since then, more than 80 condos, 40% of the property has sold. Buyers can take comfort in knowing that the Trump Hollywood is a financially solid building. There is absolutely no debt on the building. There are no foreclosures, and upon purchasing the property, the developers placed $1.5 million into the HOA’s reserve account before selling their first residence. There will be no shortfall of funds to remedy any problems while waiting for the remainder of the condos to be sold. Condo prices have been adjusted 35-40% to current market value from their initial release. But here’s the best news. At under $500 per square foot, Trump is priced significantly less than the other upscale properties in close proximity. 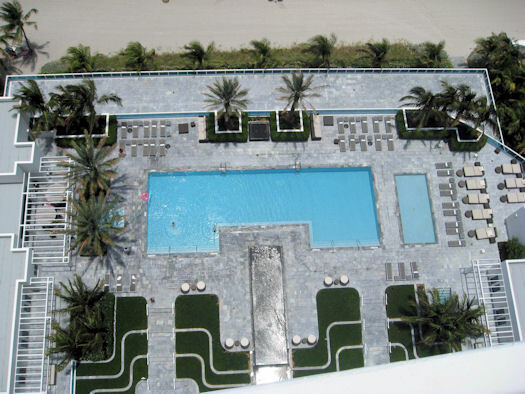 There are three comparable properties to the Trump in terms of quality of services and amenities: Aqualina, Turnberry Ocean Club and Jade Ocean. I’ve seen the comparable sales that have taken place in 2011 at these three properties, and in most cases, the prices were north of $600 per sq. ft.
On average, Trump Hollywood is priced at least 25% less than theirs. Furthermore, in the case of Trump Hollywood, you would be buying a new condo, whereas the other three are all resales. Among the floor plans are condos of two to four bedrooms. These are not your typical cookie-cutter condo sizes. These are very large, luxurious homes in the sky. Prices range from $679,000 to $6,751,000 for an 8,929 sq. ft. penthouse. To give you an idea of the range of sizes, the smallest condo is 2,088 square feet and the largest is the penthouse at 8,929 sq. ft., which comes with a 3,169 sq. ft. balcony and 1,044 sq. ft. servant quarters. Prices for the condos range from $679,000 to $6,751,000. 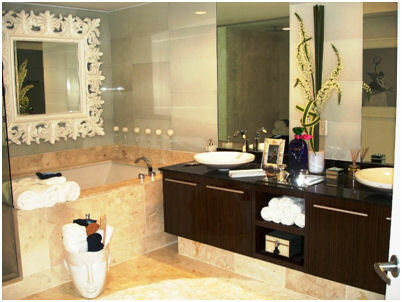 Every detail is first class such as the imported stone flooring and Italian cabinetry. Want to know more? I’ve put together a detailed data sheet on Trump Hollywood that has all the specs. Just provide your name and contact information, per the developer’s requirements, and we’ll send it right out to you. Then, I’d welcome the opportunity to meet you at the property and show you around. Request the Trump Hollywood data sheet here. As always, thank you for your interest in the properties we showcase at Condo Hotel Center. If there’s anything special you’re looking for, just ask. We have loads of great information on Florida condos and hundreds of other featured properties as well, and we’re happy to share.